Since 2015, two complementary projects are supporting African and Asian countries to accelerate progress towards gender equality in education, with particular focus on teacher training and professional development in gender-responsive pedagogy. The projects are part of the UNESCO-HNA Partnership for Girls’ and Women’s Education (2015-2020). The first project seeks to strengthen global and regional advocacy, networking and communication to ensure girls’ right to education, and develop national capacities for gender-responsive education in Ethiopia and Ghana. It is coordinated by UNESCO Headquarters and with technical support from UNESCO International Institute for Capacity Building in Africa. In Ghana, the project supports the Girls’ Education Unit (GEU) of the Ghana Education Service and aims to increase girls’ participation in science-related subjects. This includes capacity-building training for GEU staff members and the organization of STEM Clinics, one-day events that have inspired over 1,550 girls to follow science, technology, engineering and mathematics (STEM) courses and careers through hands-on activities and interactions with female role models in STEM fields. 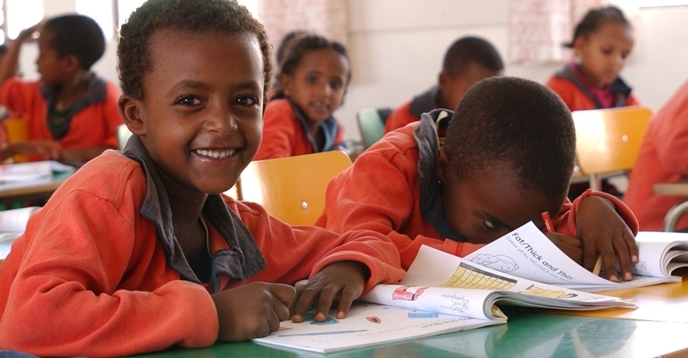 In Ethiopia, the project aims to build human and institutional capacities in three Higher Learning Institutions and 12 upper and secondary schools in gender-responsive pedagogy; improve adolescent girls’ life skills; and create a gender-responsive and safe learning environment at schools through community engagement. As part of the project, over 5,000 pre- and in-service teachers are building their capacity to teach with a gender lens; and more than 7,000 girls have been empowered to promote gender equality and girls’ rights through mini-media and girls’ club activities. The second project aims to develop national capacity in the formulation of gender- responsive teacher policy and to build the capacities of teacher trainers and trainees, school leaders and teachers to promote gender-responsive teaching and learning environments, in Cambodia, Myanmar, Nepal, Sri Lanka and Uzbekistan. It is coordinated by the UNESCO Regional Bureau in Bangkok. In the five countries, a gender assessment in teacher education systems has been conducted using a set of six tools. The key findings and recommendations have been disseminated to relevant stakeholders in each country, raising awareness on existing gender issues within teacher education policies, curricula and teaching and learning materials. Representatives from ministries of education and teacher education institutions in Asia-Pacific have been introduced to the six tools at a regional workshop in May 2018 in Hanoi, Viet Nam, to encourage countries to foster gender-responsive teacher education policies, pedagogy, curriculum and textbooks. A Training Manual on Gender Mainstreaming in Teacher Education in Asia has also been developed to help mainstream gender in the areas of teacher preparation and development at the national level. Education policy-makers, planners and teacher educators at central and provincial levels from the project countries have gained knowledge and capacity in mainstreaming gender in teacher policies, plans, training and budgeting.